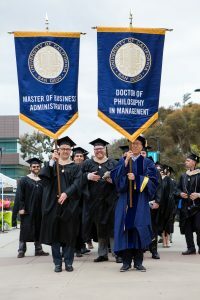 Hundreds of business leaders and entrepreneurs have emerged from the Rady School of Management since the School began in 2003. Alumni have joined the ranks of leading corporations or industry changing companies, or launched startups of their own. 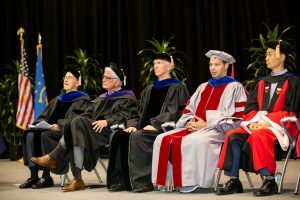 When asked about their success, these alumni have all attributed their accomplishments to the support, insight and guidance of Rady School faculty. Rady School curriculum explores innovation across a number of industry sectors while encouraging students to think entrepreneurially. Faculty lead two programs – StartR and Lab to Market – that encourage MBA students to develop and launch their own companies. Through the accelerator program and core curriculum, students gain real-world knowledge on how to create, scale, market and gain funding for their innovations. In the last three years alone, the number of entrepreneurship-related graduate courses has surged from 12 to 28 with the number of faculty teaching an entrepreneurship course growing from 13 to 23. “My time at the Rady School of Management gave me the startup bug – without this experience and having amazing professors, I would not be successful with my company today,” said Brett Blazys (MBA ’14), creator of EconEvidence.com, a consulting and finance firm. In addition to providing top-tier instruction and curriculum immersion in the classroom, Rady School faculty are leading the way in their fields of research. These contributions to scholarly research have been recognized by a number of publications — the school’s faculty have been ranked #1 in the U.S. for intellectual capital by Bloomberg Businessweek, 14th globally for faculty research by the Financial Times and 12th globally in student rating of teaching quality by The Economist. For the past two years, Professor Uri Gneezy was recognized as a highly cited researcher for his contributions to the field of behavioral economics. Gneezy’s has been featured in prominent academic publications, including American Economic Review, the Quarterly Journal of Economics and Econometrica. His research has also been referenced in the New York Times, Washington Post, Marketplace, Quartz, TIME, The Financial Times, the Boston Globe and the Economist. Two Rady School faculty were recently awarded prestigious fellowships for their respective fields. Assistant Professor of Finance Richard Townsend was awarded the Kauffman Junior Faculty Fellowship in Entrepreneurship Research, a $35,000 grant given to junior faculty members contributing to the field of entrepreneurship. The Alfred P. Sloan Foundation selected Charles Sprenger, Associate Professor of Economics and Strategy, to receive a Sloan Research Fellowship. Sprenger was gifted $55,000 to further his research, and was recognized as a “rising star” in his field. In its 15 years, the Rady School has grown exponentially, adding numerous tenure-track professors to support the growing programs, and experts in burgeoning fields of research. Today, the school has approximately 40 permanent faculty, many of whom have joined the Rady School from some of the nation’s most prestigious schools, including Harvard, Stanford, Chicago Booth, MIT, and the University of Cambridge, among numerous other institutions. This fall, two new members join the ranks of esteemed Rady School faculty. Raymond Pettit, an accomplished advertising, media and marketing research expert, will serve as the Executive Director of the Master of Science in Business Analytics (MSBA) program and the Center for Business Analytics. Robert Sanders, who recently earned his Ph.D. in Business Administration from the University of Chicago, joins the Rady School as an Assistant Professor of Marketing.